I spent the pleasant sunny part of the final day of autumn testing a vertical antenna for 80 metres using Buddipole parts for home. The back garden space here is barely 4 metres by 4 metres and for the moment the chimney is out of reach. While I have dreams of a magnetic loop for 80m, the vertical is more in reach now. I installed a counterpoise wire a few feet shy of 66 feet length hidden on a timber fence that runs down the side of the property. 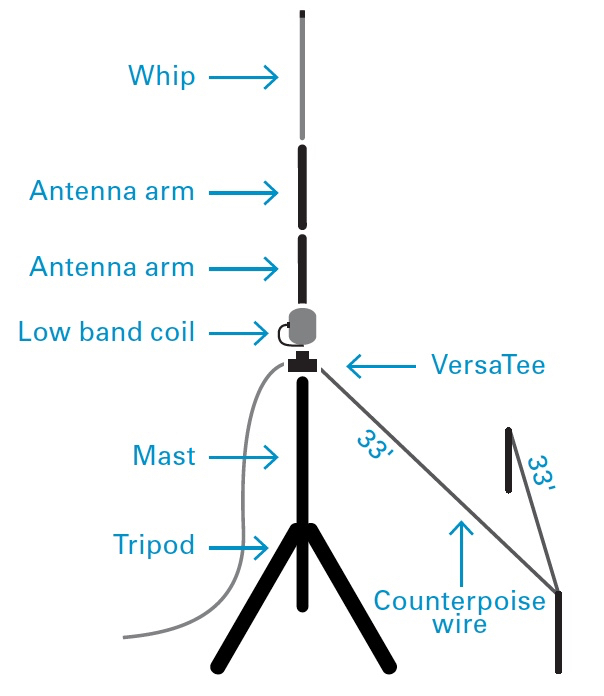 The idea is to connect a short fly lead to connect the hidden counterpoise when the antenna is deployed and then disconnect when it’s all packed away. Buddipole components don’t lend themselves to permanent installations. The counterpoise doesn’t follow the recommended dog leg arrangement and is higher off the ground than the 2 feet suggested. The purpose yesterday was to establish how speedily the antenna could be assembled and adjusted for a frequency of interest such as a net. I was surprised how easily it all went together. The adjustment wasn’t as fiddly as I expected such a short antenna for this band would be, and it appeared to give a usable bandwidth. Assembly was straightforward. Set up the tripod and mast with only bottom two sections telescoped out. Attach the Versatee horizontally to the top of the mast. 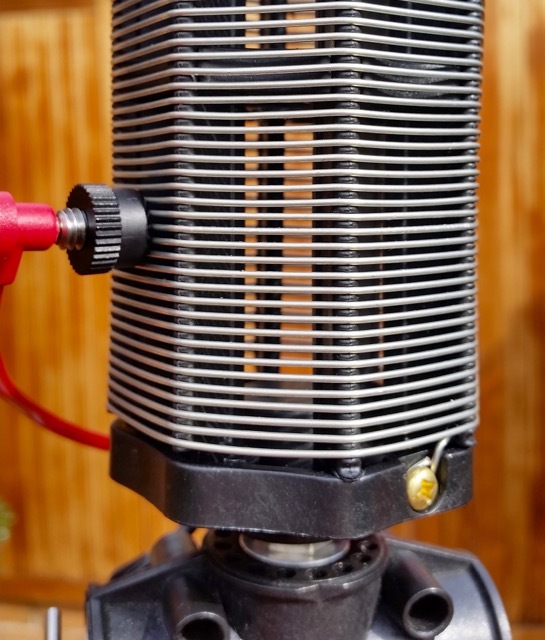 Connect the Low Band coil. Leave the red fly lead loose for the moment. Attach two 22 inch antenna arms to a long whip antenna fully extended. Then carefully attach that assembly to the top of the Versatee. I also connected a 1:1 balun between the Versatee and the iP30 SWR Analyser. The next step is to simply drag the fly lead across the coil turns to identify the best spot to tap the coil. Background noise level rises as you get in the zone. I used the iP30 SWR analyser to narrow it down to a spot 16 turns up from the base of the coil. It took me a few measurements to realise that as I progressed left (from my point of view) I was decreasing the amount shorted out and hence increasing the loading inductance and so lowering the resonant frequency. It’s actually more confusing reading that sentence than understanding it in practice! My target frequency was 3535kHz and this is a chart of the SWR readings I had when the coil tap was set at what I calculate to be 15 3/4 turns up from the base of the coil. The 1.0:1 bandwidth was 10 kHz while at 1.5:1 it was in excess of 65 kHz. From readings at the other possible coil tap points my guess is that at this frequency range each face of the coil moves the resonant frequency by about 4 kHz. One thing to be aware of with the Buddipole hardware is not to accidentally short out adjacent turns of the coil with the coil clip. It’s hard to do but I managed and it will throw your readings. 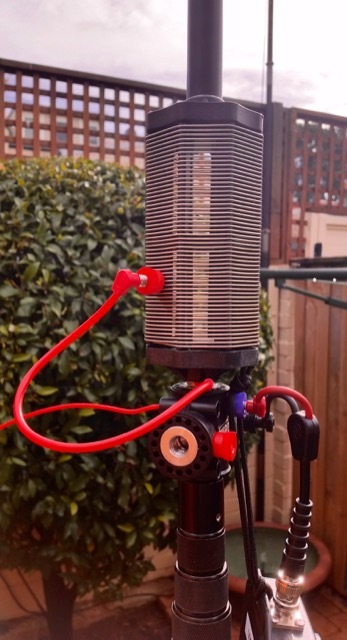 Next step of course is to make some contacts or at least activate the antenna on WSPR or JT65 to get an idea of whether the signal gets over the fence. From checking the chart on page 146 of the ‘Buddipole in the Field’ book by B. Scott Andersen, NE1RD, I estimate that my shorting tap at about 16 turns from the base means I’m using about 39-40 uH of loading to achieve resonance at 80m. So that’s a starting point if I wanted to build a more permanent and cheaper vertical installation.